The City of Victory, Jaipur, was founded by Kachhawaha Rajput King, Maharaja Jai Singh II in 1727, who ruled from 1699 -1744. His took special interest in the designing, planning and execution of the making of this city. This has been divided into nine blocks, two of which were kept for the city palace and other state buildings. The rest were for the public. The city was encircled by a city wall and seven gates opened in to the city.In 1728 maharaja Jai singh II built the observatory, still one of the main tourist attractions of Jaipur. The old city of Jaipur has neat and broadly laid out avenues, all painted in pink thus giving a magical glow to the city in the evenings. Jaipur has what the most other Indian cities do not have, a combination of cultural and architectural beauty. This is evident in the various historical sites that dot the city. Amongst the most striking monument is the Hawa Mahal. As against the popular belief it is not actually a wind palace, but a sandstone screen, specially built for the ladies of the palace to watch the processions on the roads below, without being seen.Jaipur is also famous for semi-precious stones and the best place to buy them is the Johari Bazar. Miniatures, handicrafts, clothes, Jewellery of silver and Lakh are the other items that can be bought in Jaipur. In the heart of the old city stands the majestic city palace, a former residence of the royal family. It ahs a fine blend of Rajasthani and Mughal architecture. The carved arches are supported by grey white marble columns ornate with floral motifs in gold and colored stones.Two marble elephants guard the entrance. The palace houses a museum with an excellent collection of Rajasthani costumes and armory of Mughals and Rajputs, including swords of different shapes and sizes. Some of them have precious stones embelled handles in gold.The palace has an art gallery with an excellent collection of miniature paintings, carpets, and rare astronomical works in Arabic, Persian, Latin and Sanskrit acquired by Sawai Jai Singh-II. A lush spacious garden with a zoo, an aviary, a green house, a herbarlum, a museum and a popular sports ground.It was built by Sawai ram singh-II in 1868 A.D. as a famine relief project.Recently the Rabindra Manch with an auditorium, a modern art gallery and an open air theatre has been added to promote the cultural activities.Rambagh palace has now been converted in to a leading Heritage hotel of India. The rooms have an imperial legacy and the hotel has greenery all around. The Chinese room and the swimming pool in this hotel are interesting. A fascinating blend of Hindu and Muslim architecture, this fort was built by Raja Man singh on the hill side in the 16th century. The construction was started by Raja Mansingh I in 1592 and was completed by his descendant Jai singh I. While the exterior of the fort are rugged, equally bewitching are the interiors where the fusions of Hindu and Muslim architectural styles find ultimate refinement. Painted scenes of hunting and war adorn the wall with precious stones and mirrors set in to the plaster. In the foreground is the Maota Lake giving a magnificent reflection of the Fort. 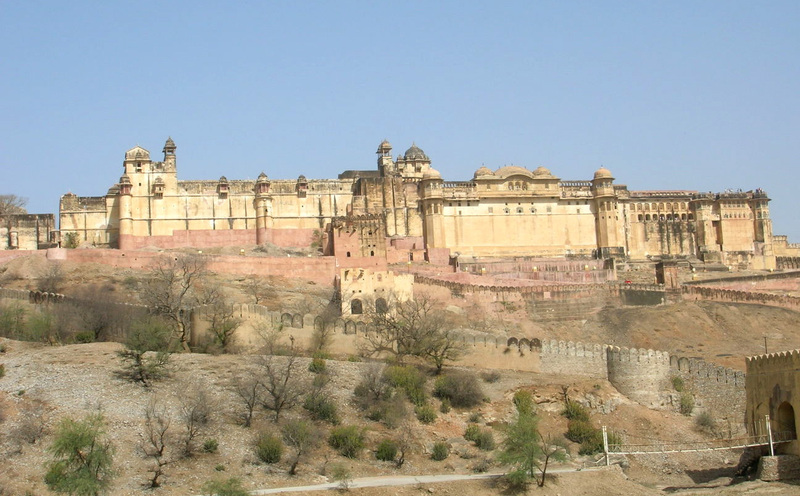 The Jaigarh fort means the fort of Victory. The fort is a rugged structure built in 172 by Sawai Jaisingh. It was the royal treasury for several years. The fort is perched on a cliff and is surrounded by huge battlements and inside walkways offering a stunning view from all sides. The world!¦s largest cannon on wheels, Jaivan is found here. It has 20 feet long barrel and the wheels are 9 feet in diameter. A sentinel to the pink city, the Nahargarh fort is situated on the Nahargarh hills about 600 feet above the city. Also known as the Sudarshangarh, this fort, is 6 km North West of the city palace providing stunning view of the city. It was built in 1734 A.D. for the defense of the city by Jai singh II. This is first of the here forts built by the kings of Jaipur. The fort carries many legends and every ruler left his stamp on it by adding to the structures within the fort. In the midst of the lake is a palatial duck blind which was used for shooting parties by the erstwhile royal families. A royal retreat for the Maharanis is also there which was used as a personal treasury for many years. The Hawa Mahal is the most important landmark of the city. This honey-combed building, known as the wind palace was originally built to facilitate the women of the royal families to watch the everyday life and the processions held in the pink city, without being seen by the people downstairs. This remarkable structure was built by Sawai Pratap singh in 1799. The outer structure look like a crown (mukut) adorning Lord Krishna!¦s head, as the building is dedicated to the Lord of whom, Sawai Pratap singh was a great devotee. It overlooks one of the main streets, adjoining the outside of the city palace wall, and lies sandwiched between the more prosaic buildings.This five storeyed, pyramid shaped structure is made up of small casements, each with windows arched roofs with hanging carvices, exquisitely modeled and carved. It looks more like a screen than a palace. The top three storeyes are single rooms but at the base are two courtyards. It is a 50 feet high thin shield less than afoot thick. The carved sandstone grills, and domes gives this palace its unique facade. At sunrise the Hawa mahal bathes in the golden light glowing like a gem and is best viewed then. Rajasthan's first 5 Star Hotel is now India's first ISO 9001:2000 certified Deluxe 5 Star Hotel by QSI America Inc., USA.A unique blend of traditions and modern comfort awaits you at the Hotel Clarks Amer. Standard Double Rooms, Deluxe Guest Rooms and Suites, Poolside Barbeque, Golf, Bar, 24-hour Coffee Shop, Shopping Arcades, culinary delights, the ambience and the leisured and royal entertainment keeping with the spirit of Rajasthan, all add up to offer a charming holiday experience at the Pink City. Located in the business district of the Pink City, Ramada Jaipur Promises international hospitality standards and the best of services, affiliated to Ramada worldwide it is a mid scale brand of Wyndham hotel group which has 10 lodging brands, 6300 properties and presence in 5 continents. Ramada Jaipur ecoes with international standards and trained staff. Business travelers will appreciate the hotel's strategic location to the Jaipur Airport, Train Station and Bus Terminal. "The key to a successful holiday is choice, which is why every action break is tailor-made for you!!" Ramada Jaipur offers 155 guest rooms and 5 suites with contemporary and stylish decor. It is the venue for the latest taste & Ramada Jaipur is owned by Dangayach Group, locally renowned in the field of Real Estate, Hotels, Jewelry and others. Business travellers will appreciate the hotel's strategic location to the Jaipur Airport, Train Station and Bus Terminal. The hotel is 10 minutes from Jaipur Airport, 15 minutes from Railway Station and 15 minutes from Bus Terminal. Chokhi Dhani Resort literally meaning the "Fine Hamlet" is a 5 star Ethenic resort, the only one of its kind in the country. With quaint mud & thatch dwellings set in sprawling acreage of land, it has 65 cottages, 8 Haveli Suits, 2 Conferences Halls, Chaupal, Chandi Mahal Bar and Bindola Multi-cuisine restaurant. The Shiv Vilas Resort has been specially built on "The Palace Theme' with the feeling of giving the "Best to the Guest" A heavy mix of romance and grandeur, it promises to offer a never before leisure and luxury with breathtaking interior and magnanimous architecture. This resort is simply a paradise on earth.Set in a beautiful landscape of Aravali mountain range, the majestic Shiv Vilas Resort is a masterpiece of architecture is an ultimate magnificence built on "Palace Theme" with world class modern hi-tech amenities. It is attracting global leisure & business Tourists from all over the world. Its easy to approach location is another big advantage.The royal ambience, the intricate craftsmanship and beautiful landscape makes it the most preferred destination in the itinerary of tourists. A visual delight for holiday maker, it revives the gracious life style of India's legendary Rajput Princes.